I arrive early. I've hitched a ride with two young recruits who will be trained here. I have no idea where we are, other than that we are at the beach somewhere, several hours away from Tokyo. We park the car and head on to the compound. It's a regular little seaside town, and the place we're staying in is a traditional Japanese guest house. We walk up to the late Miyamoto-san, who is in charge of the annual organization, and greet him. He's going over the daily routine together with Nakata-sensei. Nakata-sensei is a master swordsman and martial arts teacher, who has fought in the Afghan war in the 1980's by training the Mujahedin in different combat and sword fighting techniques. He is here to teach the recruits meditation techniques, unarmed and armed combat, and bodyguard practice. 4.30 am. Wake-up time. 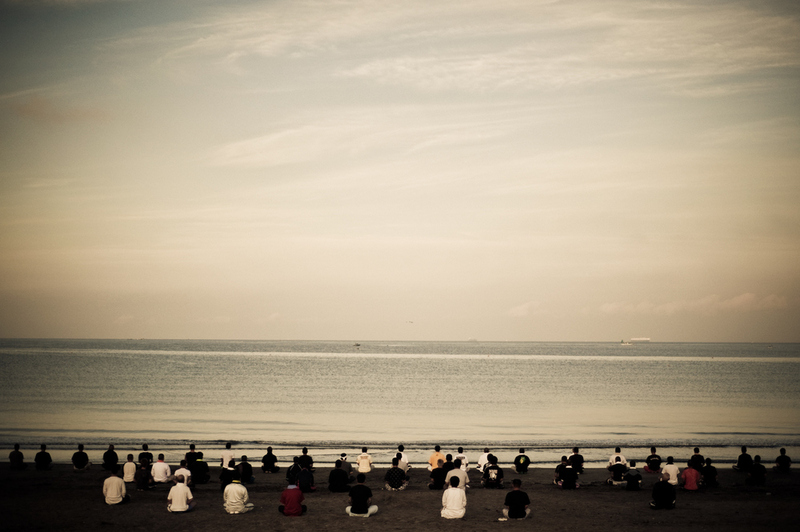 Every morning there is a meditation session on the beach, right at the water's edge. All recruits and a dozen family members are sitting in the sand at equal distances from one another. While Nakata-sensei corrects postures, everyone sits still, eyes closed, listening to the waves breaking on the beach, the mind empty. At 5.30 am, still before breakfast, the first training of the day starts: Hand to hand combat techniques. Breakfast, lunch and dinner are all prepared and eaten together. The food is a fresh as can be, fish caught in the ocean right outside the door. Everyone earns their keep by helping wherever they can. There are three intense training sessions every day, and in between, exhausted, there seems to be no other option but to rest in the dorms. And with days starting this early, most recruits go straight to bed after dinner. Meanwhile, Nakata-sensei, Yamamoto Kaicho, Miyamoto-san and the other family members, drink a beer and discuss the schedule for the next day, which starts yet again by rising at 4.30am.